I have organized the modular synthesis videos that I have created and uploaded to YouTube. These video show the VCV Rack synthesizer screen as it models a hardware synthesizer to play what I have built. 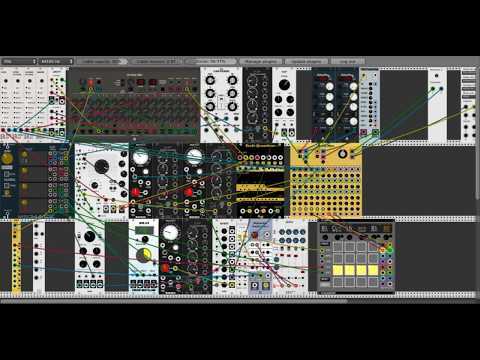 VCV Rack is a software model of hardware called Eurorack Synthesizer. If I had all of the hardware that you see in those videos, it would cost thousands of dollars. With a modular synthesizer, the musician puts together discrete modules that might all be built into a more normal synthesizer that you see on stage with musicians. Having this software model, I have spent months learning it. Interestingly, most of these pieces just took a few hours or days to build once I knew the modules and had the idea. Here is the playlist. Each piece is very different from the next. Today I uploaded a new generative music piece for both YouTube.com and Soundcloud.com. 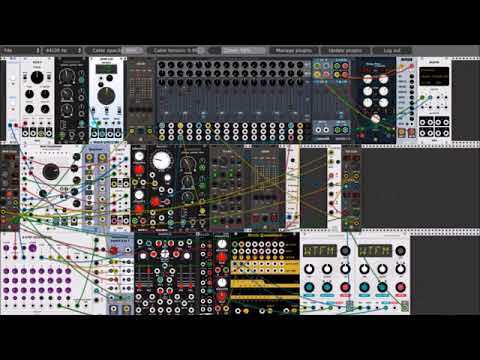 That VCV Rack modular synthesis software is quite addictive. This time, I started with the simple intent to just create a sound called the ‘Deadmau5 Pluck’ which I learned to do last year when I took the Deadmau5 EDM masterclass at masterclass.com. It was pretty easy and I added a random tune generator. Of course then it needed a bass, so I added that doing something new to me. Drums were a must at that point so I added a kick drum and made a snare drum up by modifying the noise output of the Turing Machine that was creating the original tune. That was a fun exercise. Then of course the piece needed needed some more movement and voices so I created those using different generative technique. A simple project turned complex. I call it ‘Pluck’ because of my original purpose. May we all have the best possible outcomes! Last week I uploaded a new generative music piece for both YouTube.com and Soundcloud.com. This is another piece of generative music which I call ‘Fascination’ because I cannot stop listening to it. May we all have the best outcomes! Yesterday, I uploaded a new piece of generative music called “The Blues I” to YouTube and Soundcloud. they can be viewed/listed to below. Sooo… what on earth is generative music? You can think of it as music that is generated by a process. In this case, it is generated by software called VCV Rack. This free software models hardware called a Euro Rack synthesizer which is a modular synthesizer. Modular Synthesizer? Well that is an electronics rack and all the electronics that you might find in a more normal commercial synthesizer which most bands use these days. The difference is that the user puts the electronics parts (modules) into the rack and uses movable jumper cables to connect them in any way the user wants. Thus the user can make a very large array of sounds. The modules start with oscillators for the sound wave creation (sine waves, square waves, triangle waves, saw waves, etc), filters, envelopes, low frequency oscillators, voltage controlled amplifiers to modify the sounds. After you have those, you can add many more sophisticated modules. 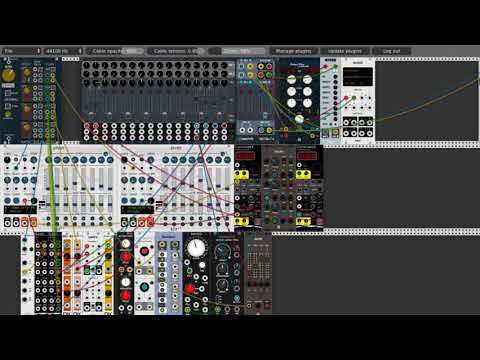 VCV Rack is still in devlopment (version 0.5) but it already has a large following and a goodly number of developers making new modules for it, some free, some for sale, some for a donation. It is completely addictive! You will see the model I built for the music in the YouTube below. I built in the basic beat and the bass with a small amount of randomness to happen over time. The lead voices (I designed what they sound like) use randomly generated notes for their parts constrained only by the beat and the musical scale that I chose. Hence it is generated music. I was surprised at how musical it sounds. As I have said before, I have taken the deadmau5’s Masterclass in EDM Production. For students in that class, deadmau5 has started a New Artist contest. Each of us can submit one song. Joel Zimmerman (deadmau5) will judge the entries and the winner will become a track on his newest album from his record label mau5trap and receive $10,000 and valuable music production software. Three finalists in the contest will receive $2,500 and more valuable music production software. Ten semi-finalists will receive $1,000 and more valuable music productions software.